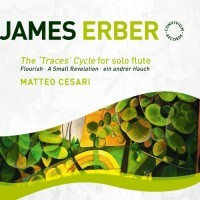 James ERBER: Flourish (1986); The “Traces” Cycle (1991-2006); A Small Revelation (2012); ein andrer Hauch* (2012). Matteo Cesari (fl, picc*). Convivium Records CR020 (1 CD) (http://conviviumrecords.co.uk/c/). My entry into this rewarding series came via a scenario I always enjoy – a highly evolved structure is interrogated, at first through hesitations and “mistakes,” and eventually falls apart. To my mind Jean Barraqué’s Sonate (1950-52) compares in focus and time span. Five piping notes signal the start. Bits of recitative will serve to brake or redirect the rich flow of argument. That opening snaps into passagework hinting at moto perpetuo and devices, always subtly arrayed, follow – fuzzed multiphonics, faint tappings, single notes repeated at great speed. Dialogue ensues with a pedal line under the main voice before a sudden break (12:40) wipes the slate. (Wittily, the drone briefly morphs into a march.) A shriek – not too loud – ends things. Attempts to extend Part One’s fluency come to naught, as long-held notes on the ends of phrases indicate bad connections – or a filmstrip sticking in a projector’s gate. Drooping tones cause alarm, an audio tape running slow? That line fragments and tappings on the instrument proliferate. Trills (in their frequency and intensity) could desire to assert the former level of activity, but held tones grow even longer, gaining a beating edge now and then; stasis is hard to shake. It winds down slowly and softly. New energy. (Traces B did about as much with a downward spiral as one can.) Material from Traces appears, wandering, and adds soundless blowing (à la Ben Webster?). An abrupt silence lands among repeated high notes. Halfway through (11:39) the last threat emerges – single tones held at extreme length, triggered by a two- or three-note prompt. (As elsewhere, flutist Cesari’s skill at maintaining these lines in pure intonation lends its own dose of the irrational.) The piece stops unresolved. I much prefer hearing the cycle “straight no chaser” – without the three small items that bracket the primary work on CD. (Flourish preceded the first Traces by five years; the other two are dedicated to Cesari.) They merit auditioning on their own.